These backlit posters are custom printed with your artwork or messaging. 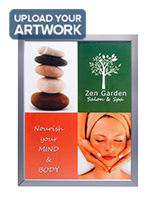 This type of translucent insert is designed for light box frames that create eye-catching illuminated displays. Each graphic is made using high quality 9-mil glossy film that diffuses light, reduces transparency and increases color vibrancy. Customizable sheets like these are imprinted using a double pass technique for increased saturation and image depth. 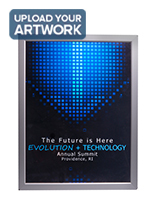 Backlit posters, or illuminated prints, are ideal for movie signs, menus, advertisements and other commercial messaging. High-quality 720 dpi prints are easily visible at different distances, making them ideal for public displays. Using an eco-solvent printing process creates brilliant graphics but minimal environmental impact. These translucent posters are available in a variety of sizes. 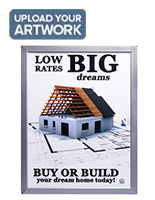 One such choice is the popular 27” x 41” graphic for classic "one sheet" graphics. 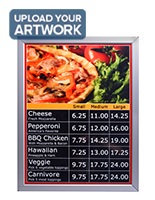 Other sizes are ideal for window signs, standing displays, wall mounted frames and other holders. In addition to these customizable sheets that can be used for original or replacement graphics, we also offer separate light box frames or kits. With these custom printed images, keep in mind that the visible area is less than the actual graphic size due to the frame width. In-house imprinting allows even customized items to ship quickly with only a 4-day lead time. Fast shipping and easy to use frames make these light box films perfect for many different usages and situations.